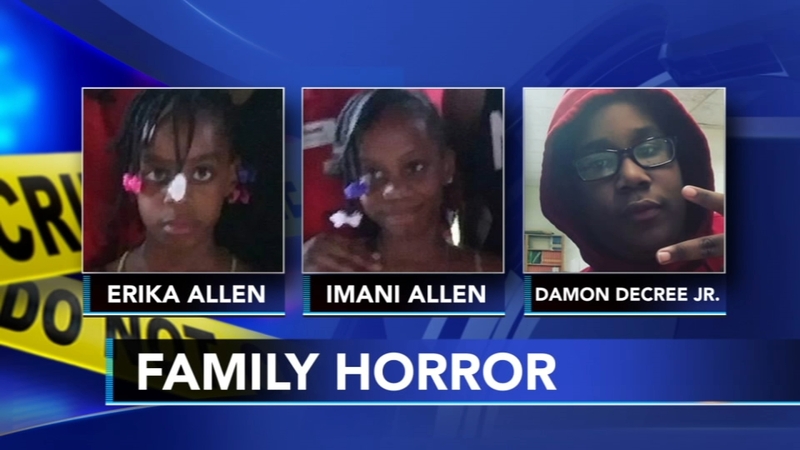 MORRISVILLE, Pa. (WPVI) -- Authorities say a mother and daughter have confessed to their involvement in the murders of five family members, including three children, inside their Bucks County home after they alleged everyone involved had been talking about suicide. Shana Decree, 45, and her daughter Dominique Decree, 19, were arraigned Tuesday on five counts of murder and 1 count of conspiracy charges. Mother, daughter charged in murders of 5 family members in Bucks County. Watch the report from 6abc.com on February 26, 2019. The five family members killed have been identified as: Shana Decree's children, Naa'Irah Smith, 25, and Damon Decree Jr., 13, both of Morrisville, Shana's sister, Jamilla Campbell, 42, of Trenton, New Jersey, and Campbell's 9-year-old twin daughters, Imani and Erika Allen. In a Tuesday afternoon press conference, Bucks County District Attorney Matthew Weintraub said it will take weeks before the exact causes of death are determined. He said there are no other suspects. "To be able to resolve a case in which five people were murdered within the course of a half a day and have the two people responsible locked up and facing justice is amazing and a true testament to the quality of law enforcement that we enjoy here in Bucks County. It doesn't make it any easier, but I'm at least grateful to say that everybody out there is safe and not at risk from these killers," Weintraub said. Police: Mother, daughter confess to Bucks County murders. Walter Perez reports during Action News at Noon on February 26, 2019. Action News is told Bucks County Children and Youth Social Services Agency performed a welfare check at the Robert Morris Apartments on the 200 block of West Bridge Street on Saturday, but when no one answered, a worker left a card. According to an affidavit of probable cause, representatives returned to apartment 5S for an unannounced visit around 4 p.m. Monday. After there was no answer, the representative contacted a maintenance worker at the complex. When the maintenance worker gained access to the apartment, he found two women, identified as Shana and Dominique Decree, in bed. The worker reported that the two seemed disoriented and the apartment was in disarray. Morrisville police were called to the scene and both were taken to the hospital. Authorities in Bucks County are investigating after they say five people have been found dead inside an apartment. Dann Cuellar has more on Action News at 11 p.m. on Feb. 25, 2019. Arriving officers saw furniture upended in the apartment, along with broken glass and clutter. The Children and Youth representative told police the apartment was not in disarray during their last visit in early February. Police initially saw four bodies in a small bedroom. The fifth was later discovered underneath another body. Police Chief George McClay says the murder scene will go down as one of the worst in Bucks County history and the worst ever in Morrisville. "We haven't had a shooting for two years. Something like this is heartbreaking to the community," McClay said. Bucks County District Attorney Matthew Weintraub says two people are in custody after five family members were found dead inside a Bucks County apartment. The affidavit says Shana and Dominique Decree were read their Miranda rights in the emergency room of the hospital and both spoke to police without an attorney present. Both were in separate exam rooms when they were being questioned. Dominique told police she lived in the home with her mother Shana, her sister Naa'Irah, her 13-year-old brother Damon, her aunt Jamilla Campbell, and Campbell's twin daughters. Authorities say Dominique had visible injuries to her neck and, at first, denied knowing what happened. She claimed that an unknown male hurt her and she kept repeating she wanted to die. Shana also first denied knowing what happened, according to police, claiming her sister's boyfriend and two unknown males came into the apartment and killed everyone except her and her daughter. Dominique separately then echoed claims about her aunt's boyfriend and two unknown males. Family members believe religious or cult motivations led a mother and daughter to kill five relatives, including three children, inside a Bucks County home earlier this week. The affidavit indicates that later, Shana told police everyone in the apartment, including the 9-year-old twins and 13-year-old, wanted to die and was talking about suicide. "Two 9 year olds can't make that decision and a 13 year old. So is that something in the adult's mind? I don't know but surely not in the 9 year old's mind," said McClay. Police said they received a call Monday from a social worker with DHS who had gone to the Decree family's apartment to see how they were doing. The caseworker reported the two suspects appeared disoriented and under the influence of something. Police would later arrive to find the five dead victims in a bedroom. According to the affidavit, Dominique told police how each person was killed. Dominique said Shana killed one twin, the 13-year-old, and Smith; that Campbell killed the other twin and she then strangled Campbell. Police say Shana also gave them an account of who did the killings. Her account varied slightly from her daughter's, saying Dominique helped her with one of the killings and that Campbell killed Smith. Weintraub said he has a pretty good idea of how the crime unfolded, the question is why. "As confusing as it was last night, we are no closer to understanding that in the harsh light of day," he said. "We will continue to pursue every lead and to work this case to its just conclusion." Authorities had been searching for Jamilla Campbell's 17-year-old son, Joshua Campbell, to ensure his safety. They located him Tuesday morning in Willingboro. He is not considered a suspect. Weintraub says Joshua Campbell was not at the home at the time of the killings. Chopper 6 was over the scene where four people were found dead in Bucks County. Both defendants are being held without bail on five counts of criminal homicide and one count each of criminal conspiracy. Authorities note that those charges could be expanding.